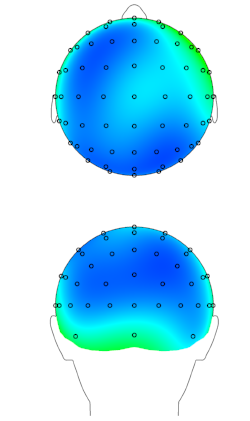 We use EEG to measure people's brain activity when performing tasks in the lab. We are mostly interested in "prediction error" signals, which are a bit like the sense of surprise. These signals can be readily measured using EEG, and are suspected to be an important part of how different regions in the brain communicate with each other. Luque, D., Beesley, T., Morris, R. W., Jack, B. N., Griffiths, O., Whitford, T. J., & Le Pelley, M. E. (2017). Goal-directed and habit-like modulations of stimulus processing during reinforcement learning. Journal of Neuroscience, 37(11), 3009-3017. Whitford, T. J., Jack, B. N., Pearson, D., Griffiths, O., Luque, D., Harris, A. W., ... & Le Pelley, M. E. (2017). Neurophysiological evidence of efference copies to inner speech. eLife, 6. Griffiths, O., Le Pelley, M. E., Jack, B. N., Luque, D., & Whitford, T. J. (2016). Cross‐modal symbolic processing can elicit either an N2 or a protracted N2/N400 response. Psychophysiology, 53(7), 1044-1053. Lavoie, S., Jack, B. N., Griffiths, O., Ando, A., Amminger, P., Couroupis, A., ... & Polari, A. (2018). Impaired mismatch negativity to frequency deviants in individuals at ultra-high risk for psychosis, and preliminary evidence for further impairment with transition to psychosis. Schizophrenia research, 191, 95-100.